Watch here the Italian TV station VCO Azzurra TV presenting the Spirit of Woodstock Festival 2018 in Mirapuri. 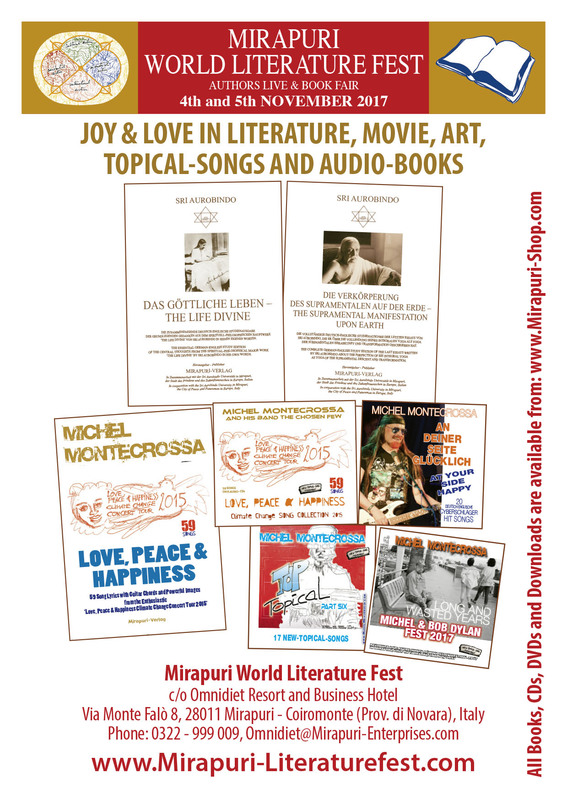 Mirakali, Sri Aurobindo and Mira Alfassa in English, French and German language, published by Mirapuri Verlag. Michel Montecrossa in 1992 launched his dynamic Cyberrocker and Cybersymphonic Composer career as peace-musician and consciousness-expansion artist after he founded in Italy together with his friends Mirapuri, an eco-art-awareness community based on liberal and world-open humanistic-spiritual ideals, well documented in Michel Montecrossa’s internationally acclaimed books ‘The Sunrevolution’ and ‘Mirapuri And The New Consciousness’.